If you have a farm, then you’ll be needing not only farm animals, but machinery as well. This means that you should find means to protect them since they are a huge investment. Now, one of the simple yet effective ways to keep them safe is by constructing durable sheds. However, these structures should be carefully designed to ensure that they can house heavy machinery, such as tractors, construction vehicles and hay tools. It is therefore important to seek professional help to get not just a resilient and functional shed, but one that is also safe and cost-effective. 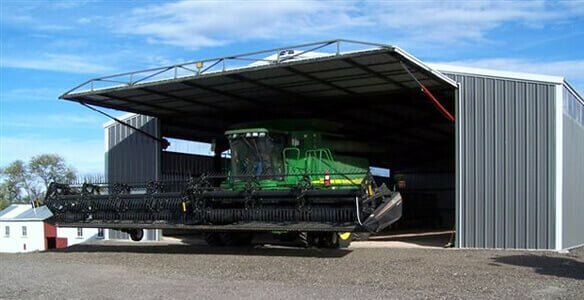 The most important thing to keep in mind when you are designing your machinery shed is the size—there should be enough space not only to house all of your equipment; a little bit of wiggle room is also ideal. Proper safety standards require that there be at least 2 feet of clearance on the door width and one foot on the door height. The building itself must also be twice as wide as the door. You also need to provide adequate floor space, depending on the size of your machines. These specifications are the minimum requirements but it is a good idea to leave some extra room for yourself to reduce the risk of any accidents. As a general rule of thumb, you can determine the minimum size of your shed with a simple formula: add together the dimensions of all of your current equipment and those that you foresee purchasing and multiply the sum by 1.15 for the extra space. If you follow this, your shed should be adequate. However, as your business develops, you may want to add new machines or replace older ones with new versions. To prepare for this future growth, it would be wise to save a little bit of extra space—this can even save you time for you only need to build your shed once! For your farm or industrial business, you probably need special storage sheds to house all of the machines and tools. However, before starting the construction process, make sure to set standards and specifications to guarantee a machinery shed that’ll serve your needs. At Action Sheds, we can help you design and build the perfect shed. To learn more about our services in Perth, call 1300 778 628.